Gabby saw his cardiologist this morning. 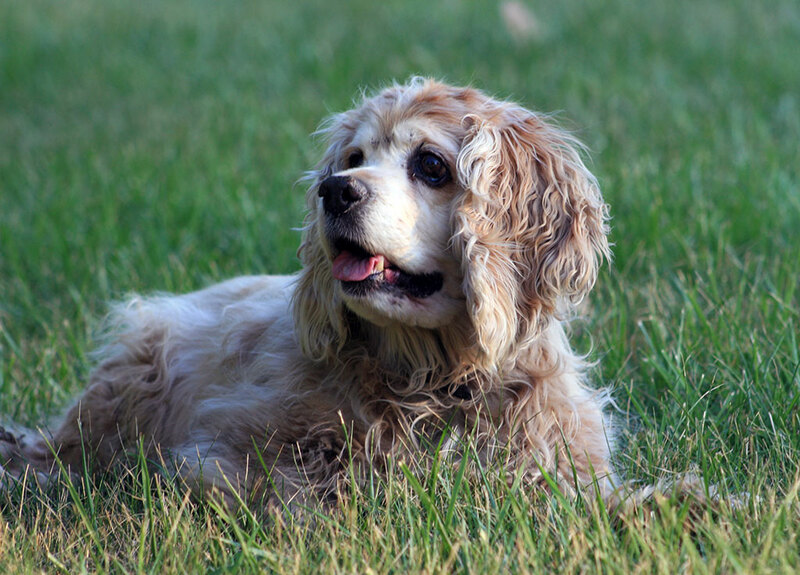 He’s being treated for mitral valve disease and an enlarged heart. Good news! Gabby did well today. He had an EKG, ultrasound of his heart, blood work, and a chest x-ray. The blood work hasn’t come back but the cardiologist was pleased with his chest x-ray, ultrasound, and EKG. She says little has changed since last year. She was pleased with his EKG because last year he began having an irregular fast heartbeat. She wants to see us in August or September and keep an eye on his cough in the meantime. These are Gabby’s heart medications. 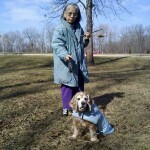 Gabby went with us on errands yesterday and we stopped at Huroc Park in Flat Rock, MI for a potty break. It was cold and windy. Gabby was excited and wanted to explore. He hasn’t been there for a while. His bad legs started to bother him so we cut our stop short. 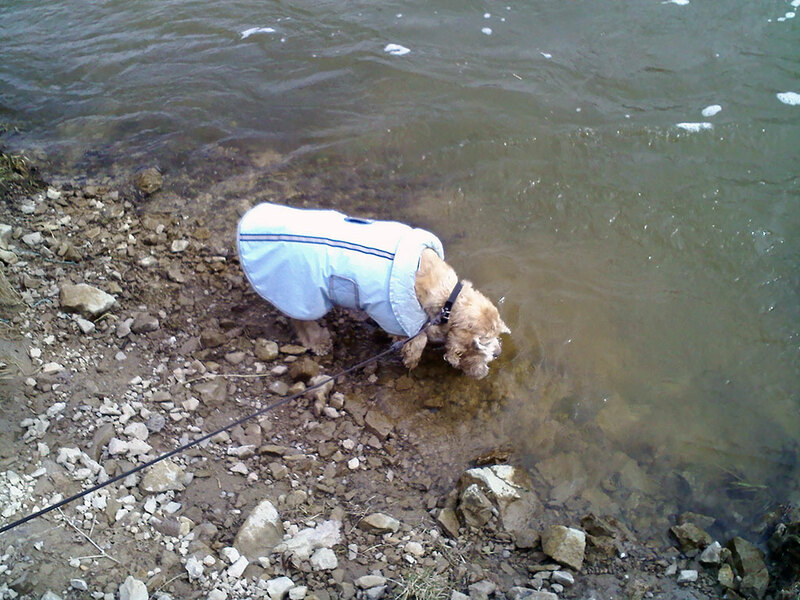 Here he is drinking water from Huron River. Gabby came along with us to Toledo on an errand. We stopped along I-75 so Gabby could stretch his legs. He had a few morsels of omelet from IHOP although I really shouldn’t have. Gabby’s pills make him thirsty so he helped himself to some pond water. My mom was with us and walked him. In the spring of 1994, my wife Cathy wanted a puppy companion. She spent most of her time confined to our apartment because of her broken bones. I spent most of my time working or sleeping. I wasn’t thrilled about the idea of having a dog. I was more of a cat person. I half-heartedly entertained the idea of getting a small dog like a toy collie since we lived in an apartment. My wife surprised me when she said, “I bought a puppy.” I never agreed on the idea, plus she took a cash advance on my credit card to make this expensive purchase. At the time we were seriously in debt. 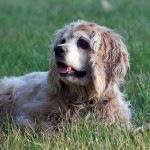 We drove out to the breeder in a rural area of Southern Michigan to pick up Gabby. Cathy had already picked out Gabby on a previous visit. We looked at the puppies. I picked up a female puppy. She was adorable and tolerated being held. But my wife said that wasn’t Gabby. I picked up Gabby who wasn’t as adorable and didn’t like being held. Gabby squirmed in my hand and cried to be let go. I read somewhere that such behaviors were unfavorable in choosing a puppy and I told my wife so. She said the other puppies were already sold. We took Gabby home. Gabby cried terribly for the first couple of nights. He missed his mother and siblings. Later we found out Gabby was infested with fleas and worms which casts doubt in the care of his previous owners. Gabby could barely walk when we got him. He wobbled around the apartment tripping over his own feet. Weeks later when Cathy had major surgery I had to take care of Gabby. As I spent more time taking care of Gabby we really bonded. I would look forward to playing with him when I got home from work. As soon as I got home, Gabby would greet me at the door by jumping on me and peeing on the floor. Soon, I was taking him for walks outside. As Gabby grew months older, he became steady on his feet and was running everywhere including the woods behind our apartment. In a 10 qt stock pot (stainless steel ONLY) put 2-3 tablespoons of butter or olive oil, heat and add the chicken, bones, skin and all. Fill pot with water to cover chicken. Add veggies and more water to cover. Cook over low to low-med heat for 2 hours. Add oats at the end or they tend to stick. After the stew has finished cooking (carrots are soft), take the chicken out of the mix and let cool…when cool debone it and mix it back into the stew. I then use an electric mixer thing to mush all of it together. You will notice an improved dog. More energy, better coat, skin, ears and most of all, you will see them acting like a puppy again. Breakfast and dinner will be a fun event. Our dogs actually watch us making this and their little noses twitch in delight all day long. As a side note, if your dog doesn’t do well on chicken, you can substitute a different protein source. For instance, beef cubes or ground beef, turkey or ground turkey, etc. If you compare the price of homecooked to store bought, this is by far a more reasonable way to go. We also use some raw foods in the dogs diet. It is recommended that you also use supplements and vitamins when home cooking. Some suggest ¼ of a centrum vitamin. Some use Missing Link. We usually mix this in with their Evo Kibble or Merrick kibble.